The original plan was to dine at Buccano’s our first night on the island. Alas, the heavy rain prevented us from venturing out. Luckily, the weather broke towards the end of the week and we were able to try this place. Dinner is only served on Friday and Saturday nights. The setting is beautiful with soft candle lights aglow. We were greeted even before we entered the restaurant, then greeted by Anne who sat us at our table, followed by a greeting by the owner who described the specials for the night. The servers were outstanding and attentive throughout. They offered us bug spray (dining is outdoors) and put one of the mosquito coils by our table at our request. I started with the special cocktail of the night, a Frangelico Nutella martini – yummy! and Hook had a Classic mojito. 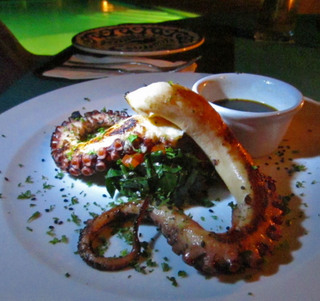 We shared an appetizer of Pulpo a la plancha (grilled octopus). Big serving, but man oh man, that octopus was tough!! And a little scary looking the way they plated it. It looked like a snake. It icked me out! Not appetizing at all. Pulpo a la plancha – tougher than a rubber hose!! 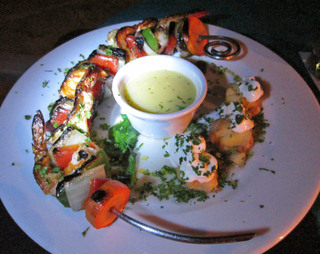 Hook had the Skewer of shrimp tequila flambe. It was tasty but the shrimps were a little overcooked. I had the Seared tuna special of the night with panko crusted green beans. It was very good. We shared the trio of chocolate mousse dessert – a Bailey’s chocolate mousse, a Lavender and Honey chocolate mousse, and a Toffee chocolate mousse. The best was the toffee mousse. Total bill was Mex$1,200 (roughly US$96) including gratuity. We would come back for a nice night out. Again we thought the portions were substantial for a fine dining restaurant. We are used to very small portions when dining at these type of restaurants!